The Editor is let loose on a couple of thoroughbreds for the end of year road test. You have had a very good 2014 and in the mood to give yourself a really nice Christmas present by way of an up-market two-seat sports car, but not too expensive! And you want something slightly different and just not another Porsche or short-lived Japanese super car. Buy British. 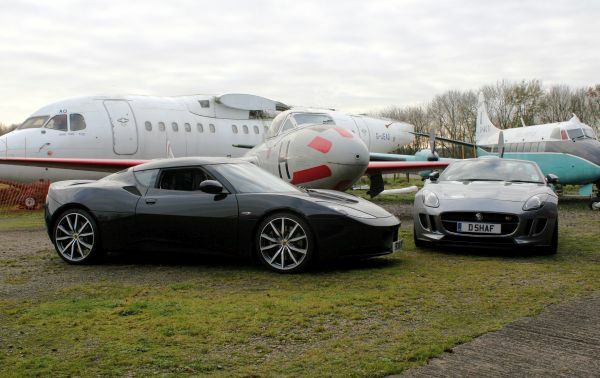 Jaguar F-Type or Lotus Evora. Both very quick. And both very desirable. Jaguar was founded in 1922 as SS Jaguar — Bill Lyons (Sir William) changed the name for obvious reasons in WWII — and Lotus 1948 by Colin Chapman. Jaguar broke all production records in 2014 and is about to hit the market with the XE, a world car aimed at a market dominated by certain German marques. In spite of new upstarts (ie McLaren) the name Lotus still has an aura about it (James Bond has helped). The (franchise) motor racing team just about survived 2014, a difficult year, but up at Norwich the reputation of Lotus for specialised engineering services continues to grow and in October announced its best half year in recent times with 1,114 units, a rise of 49%. I had the good fortune to have tried both supercars recently. Years ago I was the Lotus Press Manager, but I also have a Jaguar pedigree, the proud owner over the decades of various saloons, these required for trundling three offspring around. As for Lotus, if you have young children getting them into the back was always a problem. Now with the Evora 2+2 the (junior) school run is practical. A very distinguished aviation correspondent, and Lotus owner, says he has taken his 12-year old daughter in that back on quite some long runs without complaint. To be honest he and his wife are not very tall, nor one assumes the female offspring. My road test Jaguar F-Type S Convertible 3-litre was priced at £67,535 (+£2,000 extras) and the Lotus £63,950 again with £2,000 of extras. Yes, you can spend much more with factory add ons, but you do not have to. Both come as standard well specified. Which to buy? Read on. It is not easy. Both have superb handling, are nimble and effortless in town, with a very good ride. Thirty miles per gallon is easy even allowing for an effortless win every time from the traffic lights (less than 5 seconds to 60mph in automatic with both). Top speed is academic and since WWI is much spoken about, far faster than the Sopwith and Fokker aircraft of that era. With Jaguar it was up to North Wales, a mixture of Motorway and country lanes. Easy and ideal. For Lotus the day started in Edgware and then to Harwich followed by Bath and a Club Lotus event. Each journey was around 300 miles of relaxed quiet driving. On German roads one would have gone a lot quicker. The Jaguar F-Type has been a long time coming. Fifty years ago Enzio Ferrari said that the E-Type was the most beautiful car in the world. He would have been just as enthusiastic regarding its successor, first shown (in convertible form) at the 2012 Paris Motor Show. The even prettier (in my eyes) fixed head coupe was unveiled at Los Angles Auto Convention in 2013. Jaguar was one of the first car manufacturers to develop an aluminium sub-structure and with this project it has been extended to the body panels also. The video screen is pure XF and because it is supposed to be a sports car the gear control is in the traditional place, and not the easy to use control from the saloon. However it does have the ultra-smooth eight-speed auto transmission. There are three engine variants and now a four-wheel drive version. The Lotus Evora was first unveiled in 2008 and caused a sensation. Production started in 2010 but it has always been a low volume model and you will not see many about. Just over 1,300 Lotus (it is the plural as well) were produced in 2013, with most going abroad. The 2014 figure will be just over 2,000. Toyota produces worldwide up to 15,000 units daily. The Evora chassis is composed of bonded aluminium structure, developed for its lightweight yet incredibly stiff design. The front sub-frame carries the suspension, brakes, cooling and steering, while the immensely strong central tub contains the driver’s cockpit and safety cell – a format closely reflecting the layout and construction of modern-day racing cars – with the rear sub-frame carrying the engine, transmission, suspension, brakes and exhaust system. It is a very safe car to be in. Large doors make it easy to get in and out of. Whilst the larger car, the Jaguar strangely enough seems to be smaller once inside and the term ‘fits like a glove’ can be used. With the drop head coupe there is no storage space in the front, and very, very little behind the seat. The boot is small too and it seems that most owners dispense with the spare wheel in its entirety, but even so the space is very limited. You will not see many at golf clubs. In this respect the Lotus is far superior, the +2 offering a pair of seats of sorts to put things on, or a shelf with the +0 (that is what it is called) version. It has a well thought out boot too, not big, but OK for a couple of weekend bags. The Jaguar reputation for really smooth transportation is fast being approached by Lotus. In terms of shear bulk the Jag is 4770mm x 1923 and 1303 high. It weighs in at 1597kg. As noted it has the same superb eight-speed automatic box supplied to the saloons and paddle shifters. In fact both cars have this steering wheel device and they may work well on Formula One cars, but try changing gear on a roundabout. The Evora is 4342mm x 1848 and 1223 high and is easier to park. It has a six-speed auto box. Getting in and out is as easy as the Jaguar, something of a surprise. The Lotus tops the scales at 1467kgs. By manufacturing standards, both are low volume but in no way a compromise. True items in the Jaguar come out of the Coventry parts bin which includes Land Rover, and Lotus just does not have the buying power to have every component manufactured to its own specification. Both have restricted rear views. And both are great fun to drive, essentially weekend cars but practical for the commute if needs be. The dynamics of the pair are tremendous with superb high-speed handling, amazing stopping power and a quality feel. Both cars come with a variety of engines. From a personal point of view even the ‘cooking’ versions are more than quick enough, and both are supercharged. With Jaguar there is a choice of two 3ltr (340 and 380 PS) units and a 5ltr 550 PS model. Toyota supply Lotus with a specially modified engine with either 276hp or 345hp, which is the S model. Which to buy? It depends on your requirements. Both will literally drive you mad from time to time with their idiosyncrasies. Once you have purchased your car make sure you know your way around the dashboard. It is not quite so simple in a one week loan.